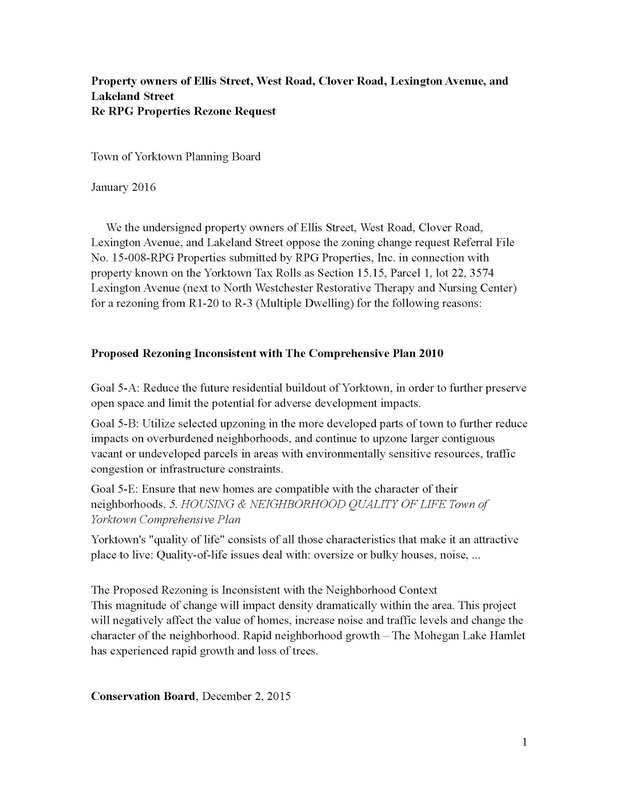 Have you heard about the proposed Lexington Avenue Rezoning from single family (R1-20)? Probably not because it was only recently brought up at the Town of Yorktown Town Board. Neighbors on the entire block are united in opposition (please see petition below; I can email you a pdf if you have trouble reading it). Basically, it allows the lot the single family is on today to fit 12 apartment units. That's nuts. Imagine that literally in your back yard where a single family home once stood. Of the seven single family homes on the block, a single lot would suddenly have 12 families; almost twice as many that have existed in the area since about the 1930's. Yikes! It's right next to George Washington Elementary. There's nothing but R1-20 around. 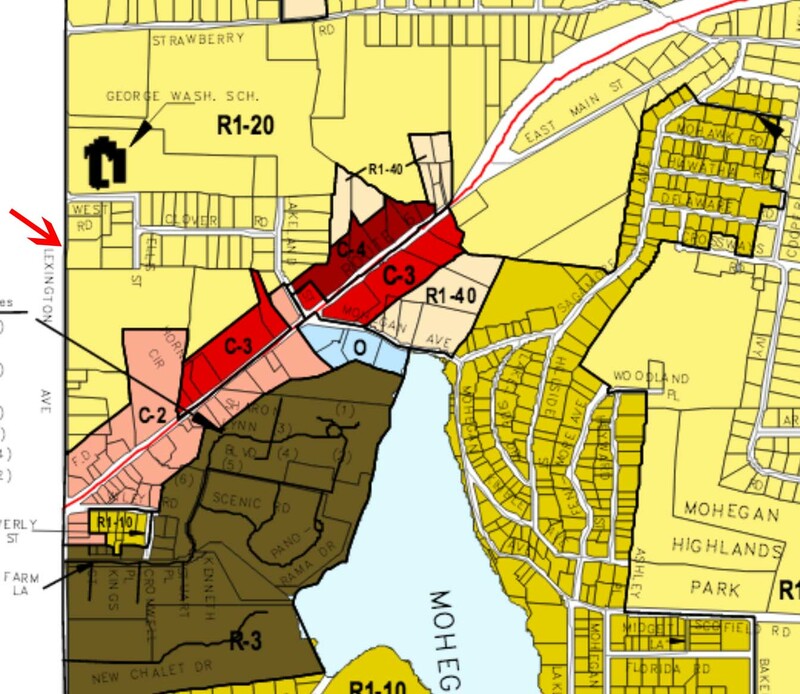 The closest R-3 are the condos on Mohegan Lake and they are a disaster, from a density perspective. It's obvious that there's a buck to be made and what better place in Yorktown to "spot zone" than the northwest corner. 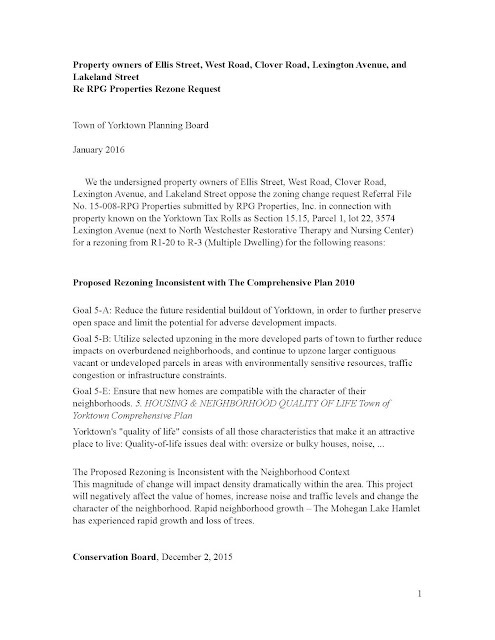 I wish the neighbors luck, but the forces on the Town Board are likely not in their favor, but let's hold off judgement just yet; hopefully they do the right thing and shoot this proposal down right out of the gate. It's interesting to note that in considering the "rezoning" the Town Board referred it to many Boards, but not the "Zoning Board of Appeals." I think that's because the don't want to have to consider the myriad variances that would be required to make 12 units on that acre lot; such information would certainly not support a rezoning. Before we look at the petition, let's consult our trusty zoning map, below. As you can see, the lot is in a sea of yellow R1-20 single family homes. Nary a R-3 multi-family zone allowing dense apartment buildings around. This issue was touched on in courtesy of the floor at the last Town Board, remember? There's likely a Town Board meeting on it tomorrow night, 2/2 at 730pm. Won't know until they release agenda. The red arrow shows the lot in question. 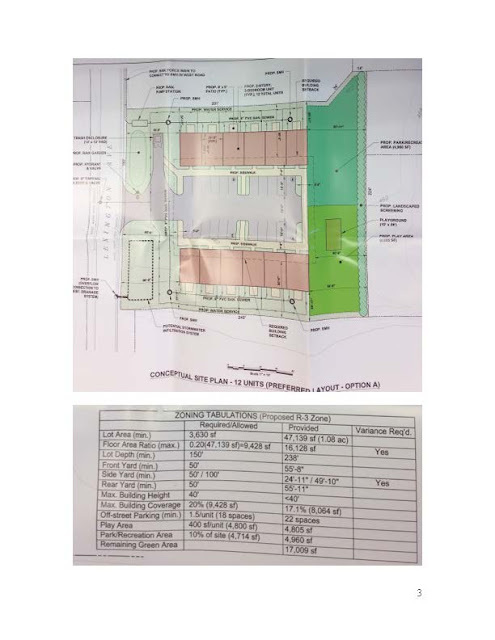 It's shocking that these 6 single family homes and the proposed rezone parcel, which comprises the whole block, could suddenly have a dozen units plunked down. Certainly not in keeping with the character of our lovely lake community. It WILL be on the agenda tonight. 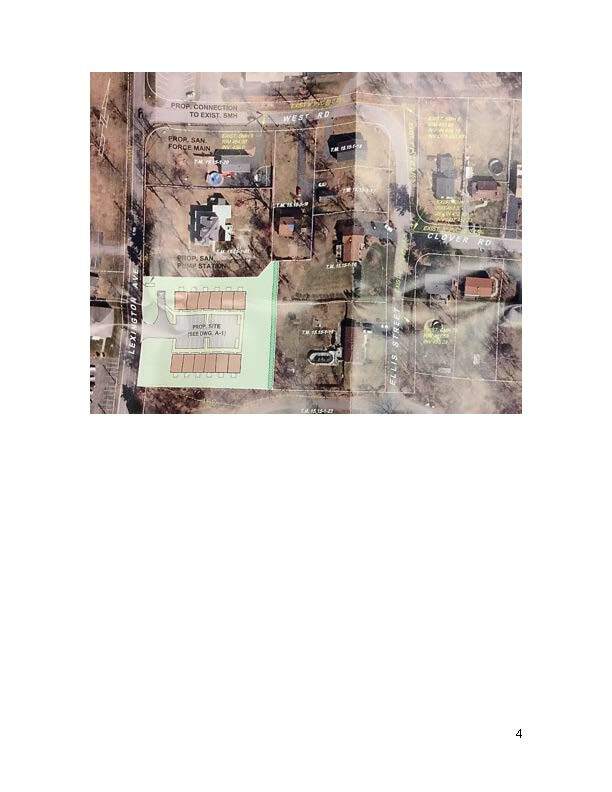 The public hearing was announced a few weeks ago and is listed on the Town Clerks page.http://www.yorktownny.org/townclerk/public-notices. It is very important for as many people to attend this public hearing if you want the board to hear your objections. All public comments will become part of the record for this hearing and once the hearing is closed, who knows. Send letters to the board as well, and these will also become part of the record for this hearing. The people who came to the last meeting on Jan 19, need to repeat their comments because the comments made on Jan 19 will only be included on the minutes of Jan 19 and WILL NOT be included in the public hearing record. I really appreciate you comments. Very insightful. I believe I've seen you speak at several meetings and think you are very succinct and thoughtful. Great suggestions. I especially like #3 and #4. I would only add that not only review the few arguments provided by the applicant (RPG) which were silly (show me an R-3 zone nearby that would justify an extension to this one acre lot, Mr. RPG), but also the Town Board members. It was if they had rehearsed a couple talking points. Very excited for the next public hearing. I'm coming out of retirement! The board hardly asked any questions. The most disturbing issue is that many of the questions and concerns related to trees, drainage, etc. will only be answered and worked out AFTER the board gives approval. 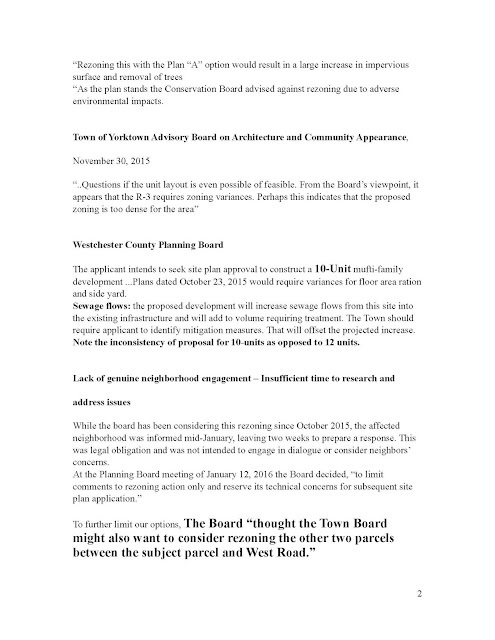 Perhaps these are the issues that need to be pressed by the neighbors most of all before the board gives it's approval. I know it is expensive, but the homeowners might consider hiring an attorney.